This is a prime lens manufactured by Tamron and the model was launched 2003. 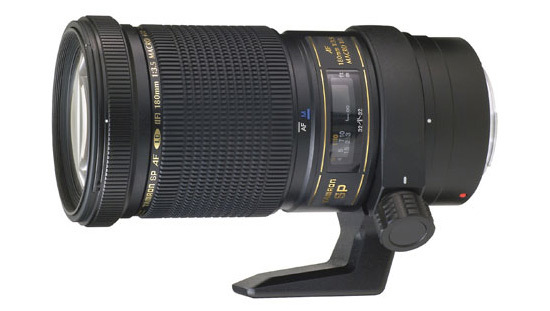 A focal length of 180mm, 1:1 (life-size) macro reproduction, a fast, constant F3.5 maximum aperture and an optical formula featuring two LD (Low Dispersion) glass elements combine in a lens perfectly suited for extreme close-up shooting with an extended front element-to-subject working distance. The SP 180mm F/3.5 Di´s characteristics also lend themselves to indoor, close-range sports shooting and beautiful environmental portraiture. A special FEC (Filter Effect Control) function reintroduces ease to the use of a polarizing filter. Canon and Nikon mount-variants feature a focus ring with instantaneous switching between auto and manual focus for fine-focus adjustment. As a super performance ( SP) lens, this lens belongs to the best macro lenses in the world. It has very good resolution ability, strongly decreased light fall-off up to the edges, minimized chromatic aberration and excellent stray light behavior making this lens the first choice for digital APS-C and full frame cameras. This lens was constructed for macro functionality; however, it also makes an excellent figure with medium-tele shots and shines with its extremely sharp, high contrast and high brilliant results. This lens stands in the tradition of the legendary 90 mm 1:1 macro. Apart from the long focal length the lens also offers a big working distance, which is often required for capturing images of small creatures. Furthermore, the so-called FEC (filter Effect Control) allows the rotation of a polarization filter while the hood is attached. * SP ( Super Performance) - This lens belongs to the Super performance ( SP) class of Tamron lenses distinguished by ultra high optical and mechanical quality. The designation “Di” (Digitally Integrated Design) marks a generation of lenses, which have been specially adapted to the higher requirements of digital SLR cameras (APS-C and full frame). "